The Fairphone community is the backbone of our movement. Time and time again, they wow us with their energy, motivation and willingness to pitch in and help. Recently, all across Europe, Fairphoners have been organizing meet ups, swapping modules and discussing topics related to fair electronics. Keep reading to learn more about what our community has been up to and how you can get involved. At the end of August, we launched new camera modules for the Fairphone 2. Which gave our community a great reason to get together! 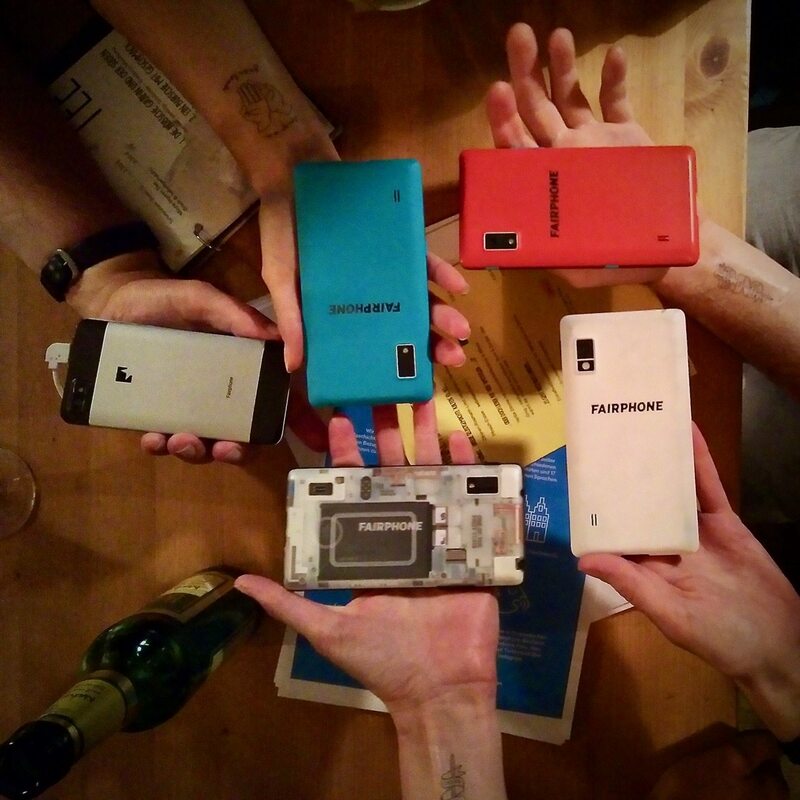 So last month, Fairphone fans in nine cities and three countries gathered in bars, libraries and restaurants to do the “fairswap”. The goal of these meet ups was for community members to assist each other with swapping their old camera modules for the new upgrades. We thought it would be a great opportunity to support people who suffer from what the community calls “fear of disassembly”. Because opening of an expensive gadget can still be a daunting task – even with a device like the Fairphone 2 that basically invites you to open it. Sadly (or happily?!) that approach failed: There were no members with fear of disassembly, and everyone had already upgraded their cameras without any issues. Great job Fairphoners! But even without focusing on cameras, there was still plenty to do. The meet ups provided an opportunity to complete other repairs and software updates, discuss the latest developments in fair electronics and simply get to know the local Fairphone community. In Aachen (DE) there were 15 participants and 0 disassembly fears. They replaced screens and performed related updates. In Düsseldorf (DE) they did some Fairphone 2 repairs and OS updates. They also talked about everything from responsible materials to urban mining. In Bradford (UK) they hosted their first ever meet up. In Hamburg (DE) they discovered that one of the adhesives used in the Fairphone 2 is actually produced in their city. 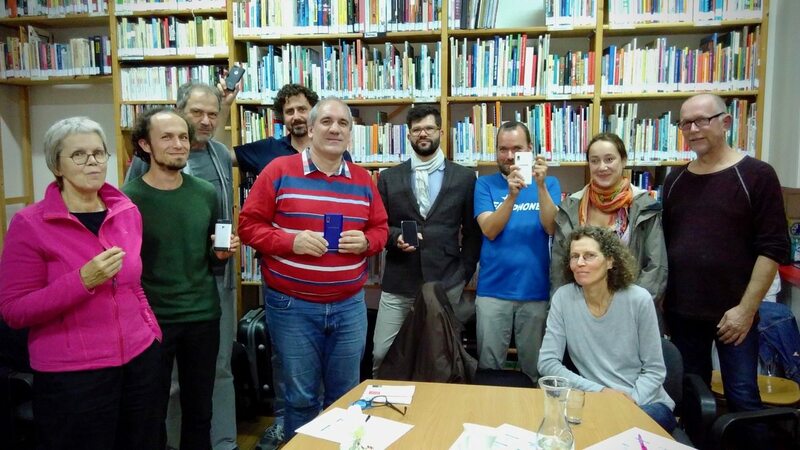 In Linz (AT), the community coordinated their meet up with the WearFair event, where they also promoted Fairphone. In Stuttgart (DE) they spent quality time testing out their new cameras and comparing (temporary) Fairphone tattoos. In Munich (DE) they host meetups every single month, so it has become a nice routine. Leipzig (DE) was so busy being social, we haven’t received an update yet! And in Vienna Global2000 (AT) opened their doors to welcome members of the community in. All covers present in Stuttgart. Notice the fancy (temporary) tattoos! Meet ups like these are an excellent way to make new connections and get help with repairs and other technical issues. Or if you’re considering getting a Fairphone, they are the perfect place to see and try the phone before you buy. Want to join the next meet up near you? Have a look at the community map to see if there is already a group in your city, and keep an eye on our events page to see what’s coming up. If you don’t see anything in your area, you might consider organizing your own meet up. On the forum, you’ll find lots of helpful tips for how to get started. While our community is very active in some countries (we’re looking at you Germany and Austria! ), in other places we could use a bit more support. Especially Spain, France and Belgium could, for example, use some community activity. You can also send me an email at community@fairphone.com if you have questions. Besides meet ups and groups, some of our extra motivated community members came up with a creative new way to support other Fairphoners. They call it the Fairphone Angels. While this initiative is still in the pilot phase, you can already reach out to our Angels to get help with repairs, discuss software problems and share details about community events – online or in person. Finally, you can always connect with the community on our regular channels, like Facebook, Twitter and the Forum to get the latest news, ask questions or offer advice. To say that the Fairphone 2 is connecting people might sound cliché. (And it might also be the slogan of another phone manufacturer). But I have to say it. And it’s wonderful to see this connection between community members happening in real life, on the ground, between people who have never met before. So I’d like to say thank you to the Fairphone community members for your time, dedication, enthusiasm and everything that you do for the greater cause; making electronics fairer. At Fairphone HQ we love you to pieces. Erhm… I mean modules.